A day of celebration for the beauty of Italian landscapes. 9 September sees the coming round of Panorama Day, an event promoted by FAI Fondo Ambiente Italiano and Fondazione Zegna in some of Italy’s most enchanting landscapes, such as Podere Case Lovara at Punta Mesco, Levanto (La Spezia), Castello e Parco di Masino at Caravino (Turin) and Oasi Zegna in Trivero. Here amidst the Biella alps there will be a grand event focusing on dialogue between music and nature and featuring young talents from Obiettivo Orchestra, a project carried forward by the Filarmonica Orchestra of the Teatro Regio Torino. The new development at this, the 5th, Panorama Day at Oasi Zegna is “Narration, listening, conversation… in the garden!”, a musical matinée starting at 10.30 in the garden of Ermenegildo Zegna’s villa. The young musicians will be playing some of the most beautiful works in the chamber music repertory (from 10.30 to 12.00, by reservation only, 50 places available). 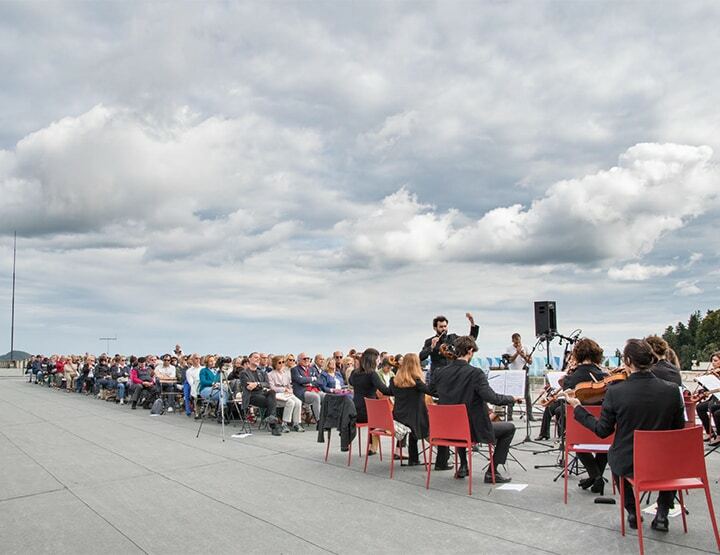 An engaging foretaste of the bigger afternoon concert on the roof of the Zegna Wool Mill, where Daniele Ruffino will conduct the young strings and 1st viola Enrico Carraro of the Filarmonica del Regio in music by Mozart, Vivaldi and Barber. The unusual and panoramic setting is also graced by artist Daniel Buren’s colored flags. The concert starts at 15.00 and there are a limited number of seats. Music is not the whole story though: to enjoy the beauty of the landscape there will be panoramic walks, in the morning, on easy paths accompanied by guides from the Equipe Arc-en-Ciel, while kids and their parents can enjoy workshops at Cascina Caruccia in the Conca dei Rododendri (2 km from Trivero). Entitled “Mettiamoci d’accordo!”, these workshops will bring together music and the sounds of nature and footsteps along a route made up of pauses, syntony and harmonies (start times: 10.30, 11.45, 14.30, 15.45). Throughout the day it will also be possible to visit an exhibition - “Uomini all’Italiana 1968” - at Casa Zegna (a stone’s throw from the Wool Mill). This tells the story of 50 years of Zegna clothing, with photographs, vintage garments from the company’s historical archives and other period materials (info: from 10.00 to 18.30, till 28 October, fondazionezegna.org). And lastly, the gourmet opportunities, including picnic baskets prepared by farmstays Oro di Berta and Ca’ nel Bosco (the latter produces excellent goat cheese) and traditional style lunches in Oasi Zegna’s various restaurants and mountain huts. INFO: Panorama Day, Sunday 9 September 2018, from 10.00 to 18.00. Booking is obligatory for the 15.00 concert on the roof of the Ermenegildo Zegna Wool Mill: archivio.fondazione@zegna.com, tel. 015 7591463. Contribution to FAI: 10 euros (reduced to 5 euros for kids under 14). Walks with the Equipe Arc-en-ciel guides cost 8 euros per person and start at 10.30. For info and booking: tel. 015 0990725 / 349 4512088, or e-mail to maffeo.geologo@gmail.com.